It is official. Detroit is bankrupt. Detroit is not only bankrupt they can now trash pensions owed to city workers. That is police, fire, hospital and a host of workers counting on those pensions for retirement. The U.S court ruling allows for a bankruptcy type for cities and towns, Chapter 9, to proceed and specifically puts pensions on the fair game bankruptcy chopping block. Detroit is now the largest city bankruptcy in the history of the United States. The city's debt is estimated at $18 billion. Chapter 9 bankruptcy allows for the bankruptcy court to negotiate with credits and no city asset is untouchable for a fire sale to pay bills. This includes the city's art collection. The ruling pensions can be cut is devastating to all those relying on those pensions for retirement. The unions immediately filed an appeal. It is estimated pensions will cost the city 65% of Detroit's revenues by 2017 and will have negative cash flow by $376 million that same year. This is while banks along with their derivatives and swaps are up to be paid, as first reported when Detroit filed for bankruptcy. The average pension in Detroit is $19,000. How much the cuts to the estimated 20,000 city worker's pensions is unknown. Even though the pensions are funded to about 80%, it appears there might be worse cuts to the meager pension amounts of workers than the unfunded 20%. Detroit has about 78,000 abandoned buildings; 38,000 are deemed dangerous. The city reports 11,000 to 12,000 fires a year, about 60 percent in blighted or unoccupied buildings. During the first quarter of 2013, frequently only 10-14 of the city's 36 ambulances were in service. 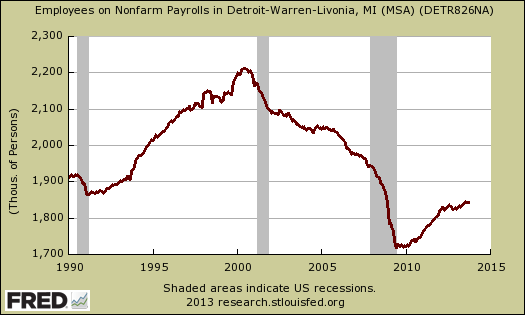 Unemployment in June of 2000 was 6.3 percent in Detroit. It was 23.4 percent in 2010 and 18.3 percent in 2012. In 2012, 136,000 crimes were reported in the city. Of these, 15,200 were violent. The city's clearance rate for violent crimes was 18.6 percent, 'substantially' less than the national average and in neighboring communities. In April 2013, about 40 percent of the city's 88,000 street lights were not working. Detroit's population, projected near 684,000 in Dec. 2012, is just 37 as large as it was in 1952, when the population peaked near 1.85 million. In 2013, 39 percent of the city's revenue was spent to service "legacy liabilities." That figure is projected to increase to 65 percent within five years at the current rate. Detroit operated at a general fund deficit for seven straight years, 238 million in 2013. The city would have run out of cash in June of 2013 had it not deferred $120 million in pension payments and borrowed $30 million previously the same year. At current rate, the city is projected to run a cash flow deficit of $190 million in 2014, $346 million by 2017. For five years ending in 2012, the general pension payments $1.7 billion less tan it paid out. The Police and Fire pension raised $1.6 billion less than it paid. Detroit reduced the number of city employees by 2,700 in 2011 to 9,560 in May. City software is obsolete and not integrated between or within departments. According to reports, Detroit has over 100,000 creditors. Protection by bankruptcy law will stop those creditors from taking civil legal action to collect on money owed to them. Well, first the auto industry offshore outsourced jobs as well as moved to cheap labor states. Detroit has lost almost a million residents and from 2000 to 2012 and the people counted as either employed or unemployed has shrunk dramatically. Detroit is ground zero for wage arbitrage and the impact bad trade agreements, offshore outsourcing has on a city. It is so bad, Motor City should get a new name, F&*$ed Over City. Yet with the globalization neutron bombs going over Detroit, that is not what devastated the city. It was massive borrowing from the banks as reported by the Detroit Free Press with the below graph to show the increasing debt damage done. In other words, Detroit's nail in the coffin was caused by Wall Street. While the damage has been building by ineffective, hoodwinked and even obviously corrupt city officials, the deal which broke Detroit's financial back was with, you guessed it, the banks. Specifically interest rate swaps along with derivative based loans is what did the city in and guess who originated these loans? Bank of America, UBS and Merrill Lynch. Corrupt Mayor Kilpatrick borrowed $1.44 billion with various derivatives, including interest rate swaps. These derivatives can then blow up and cost the city a whopping $2.8 billion over 22 years. This is 20% of Detroit's debt. Kilpatrick was just sentenced to 28 years in prison for creating a pay-to-play city government. Detroit is set to return to court on Dec. 17 to seek approval of a proposed $350 million debtor-in-possession financing from Barclays Capital Inc. Though Detroit's city council on Oct. 21 unanimously voted to reject the financing, because the group did not propose alternate financing within a seven-day deadline, the city was to seek approval of the Barclays DIP from a local emergency financial assistance loan board. In an Oct. 11 statement, Orr said the financing would allow the city to obtain a more than $60 million discount on the settlement of certain pension debt interest rate swap obligations, save millions of dollars of annual debt service, fund Detroit's restructuring and improve the future recoveries of its creditors The DIP also would put money in the city's nearly empty coffers for the delivery of municipal services to its residents, including public safety initiatives, blight removal and technology infrastructure improvements. The city would use about $230 million of the DIP to terminate certain pension debt interest rate swap obligations. Detroit purchased the swaps in 2005 to ensure 6% interest rates on about $800 million in variable-rate pension debt. The swaps are held by UBS and Bank of America Merrill Lynch. The remainder of the DIP, about $120 million, would go into municipal services, according to the Oct. 11 statement. The DIP, comprising two series of secured bonds, would accrue interest at Libor plus 250 basis points, with a 1% Libor floor. In the event of a default, including the failure by the city to redeem the note in full on the maturity date, the initial spread would increase by 200 basis points. The financing would mature on the earliest of the dismissal of the bankruptcy case, the effective date of a plan of adjustment, the acceleration of the debt or 30 months after issuance. In case it is not clear, the bankruptcy ruling means the emergency fund manager Orr can go ahead and make the Barclays loan, pay off the previous banks in full and set up even more Wall Street derivatives fun for Detroit. In other words, the bankruptcy judge just ruled for the banks while city workers instead of being protected, got their meager pensions raided. Sound familiar? It should, this isn't the first time banks sold some city a derivatives time bomb which brought the town to bankruptcy, it is just the largest. Where Detroit is unique is not good news. The court just set a precedent to allow cities to rob pension funds and empty the coffers through bankruptcy. This opens the door for other municipalities to wipe out worker's retirement. To date this lovely practice of handing people's retirement over to Wall Street through bankruptcy was only in the private sector. Now government workers' retirement funds are also not safe. Detroit presents an extreme case of pension instability because of its combination of scale, corruption of both private and public officials, and underlying economic weakness. However, the underlying problem applies to all public pensions and both workers and public officials need to address them sooner than later. 1) Public employees are the largest and most cohesive bloc of voters in most local elections. There is an inherent conflict of interest between the politicians who approve pension increases and the voters (workers) who receive them. Pensions that allow employees to retire at any age with 20 years service, that include automatic COLAs, and/or include health benefits are common, although disappearing fast, in the public sector. The increases in life expectancy in the United States, and the associated increases in health care costs that have facilitated that increase, have added a huge burden to the cost of existing plans. 2) Public pension expenses are set by actuaries who use smoothing techniques to amortize the current cost of the pension over what is generally a 3-7 year period and the longer term unamortized, unfunded cost that accrues over the life of a pension plan is amortized over 20-30 years. The stated purpose is to minimize the fluctuation in funding requirements for governments but the consequence is that when an inevitable economic downturn occurs, the cost is smoothed away into the future, a technique that fits government's proclivity to delay difficult decisions. Today in Florida, the average local pension plan is only funded at about 80%, the same as quoted for Detroit. Conversely, under this actuarial smoothing, the funded ratio almost never goes above 100% because only any long-term unfunded liability is amortized, not any long-term contingency fund to account for the next downturn. 3) Public pension plans are historically very generous, although is rapidly changing as well. Multipliers for years of service of 2-3%, and even 4%, are common, meaning an employee can retire with 70-100% of final salary at age 55 or 60 provided they have put in 35 years. It's a nice benefit if you can afford it but it is not sustainable. 4) Public pensions only became prevalent in the past 75 years. The pension plan lifecycle is such that in the early years, benefits are being earned but nothing is being paid out. But as plans age, the balance starts to tip. Along the way, all of the accumulated benefit increases, funding shortfalls, and bad investments multiply one another. At the same time, a slowing birth and immigration rate and longer life expectancy slows the growth of the cities and states that fund plans and creates more demand for services other than funding pension plans. The biggest problem for public employees who have a pension, life myself, will be the precedent set in Detroit, San Bernadino, Jefferson County, and other local governments over the past 5 years. It is not so much whether pensions are sacrosanct in bankruptcy proceedings as it is the fact that governments contemplate bankruptcy at all. 20-30 years ago, it was nearly unthinkable that any city, or even individual, would countenance the shame of bankruptcy. But the stigma is gone from individuals and now is disappearing from governments. Faced with huge deficits that require significant tax increases above already-high rates, elected officials can now go to their voters and say "Which would you prefer, increasing your taxes or paying pensions for a bunch of people who no longer work here?" There is little shame left in our society at any level to make anyone do the right thing. The only hope is that public officials and public employees will recognize the depth of the problem illustrated in Detroit and make meaningful changes in their own plans to make them affordable and sustainable. I'm not too optimistic about that happening. This is a real problem in that most often the worker has already paid into the pension, case in point was Hostess. So, this is basically theft of deferred wages. By allowing anyone to not pay pensions through bankruptcy law is really glorified theft and the impact of this is probably showing up now, but is going to be a hell of a wallop as people age with nothing but social security left (which is also under attack). It shouldn't be a question of public employees still getting pensions instead how private employees have been systematically royally screwed and the entire stripping of earned pensions should be made a criminal offense. Kills me how theft by law, spreadsheets and figures is perfectly legal yet the idiot with the gun at the convenience store for $100 bucks is going away for 20 years in prison. It is the same act. Stockton and San Bernadino were both made weak by similar money manipulations in the housing market leading to boom and bust. Airline pensions were taken in a similar fashion. Time to be honest about pensions and social security. Either provide safe haven for the money paid from paychecks or do not collect the money. Too many cities in the US will be next if Detroit wins the game the judge set up making loans, bonds and pensions just contracts to be renegotiated by selected judges and courts. I Blame our congress senate and presidents for bad trade deals that destroyed the manufacturing sector of the economy. The news should be reporting on this daily but they do not. They remain silent as America crumbles. These people are traitors and should be exposed. The symptom of the bad trade deals is 17 trillion in debt as the american people can no longer support themselves.